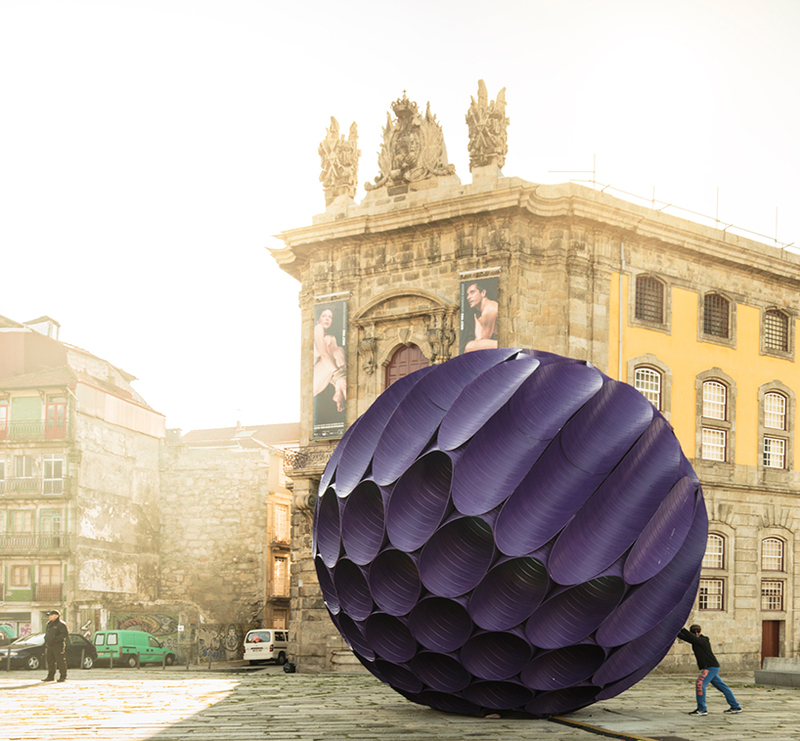 FAHR 021.3 is a porto-based collaborative practice that focuses its work between the disciplines of art and architecture. 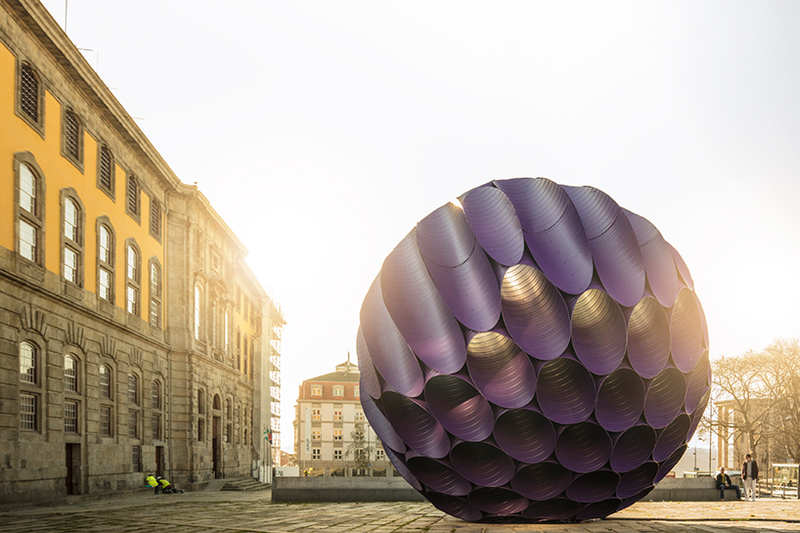 in the historic heart of porto, FAHR 021.3 has conceived a larger-than-life spherical installation that seemingly shifts the center of the city square towards its gravitational pull. 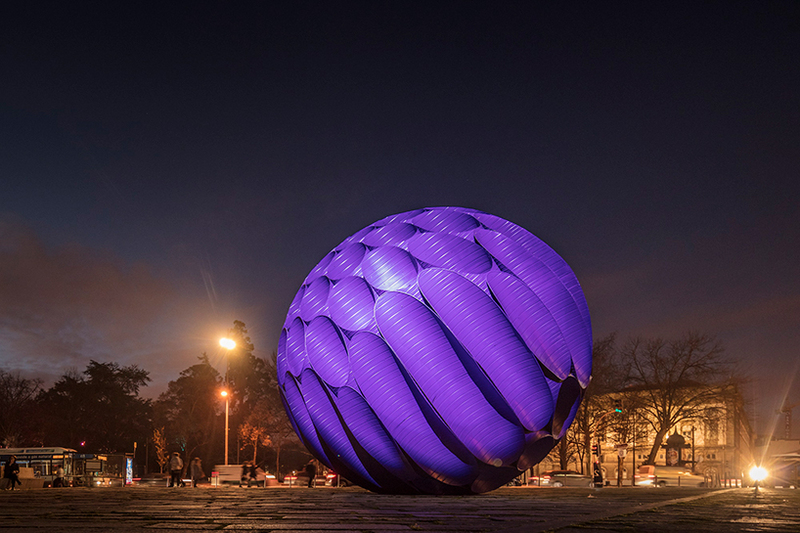 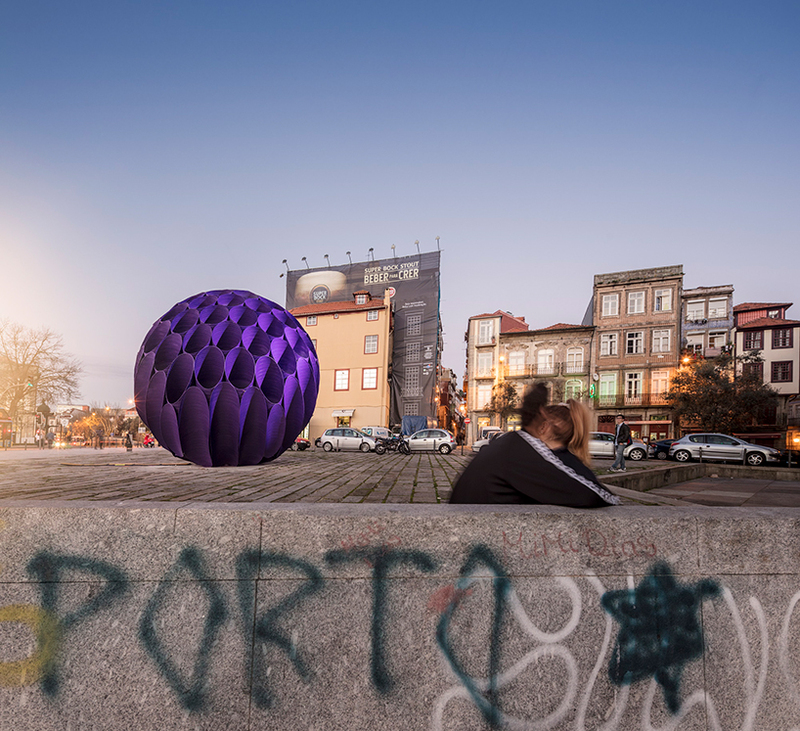 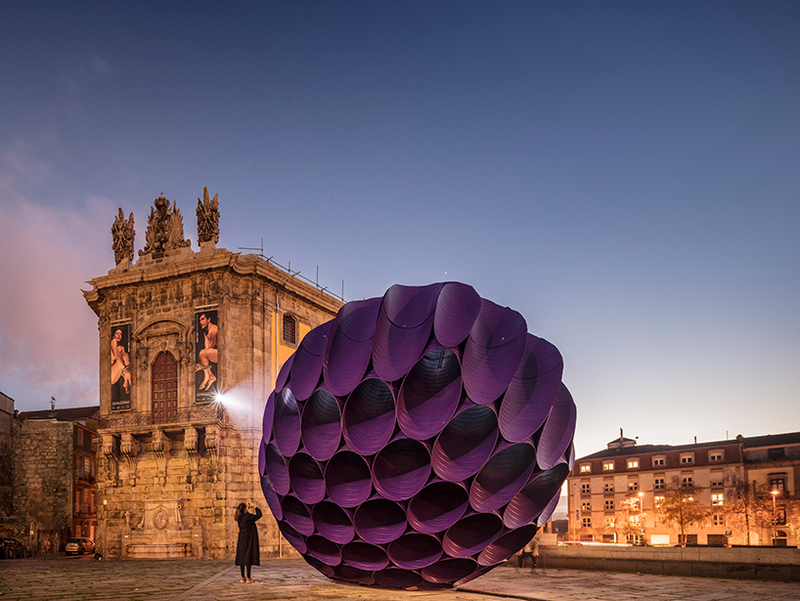 in celebration of the 20th anniversary of porto’s classification as UNESCO world heritage site, the collaborative art and architecture practice has realized ‘eclipse’ to encourage passers-by to re-consider the familiar amor de perdição square. 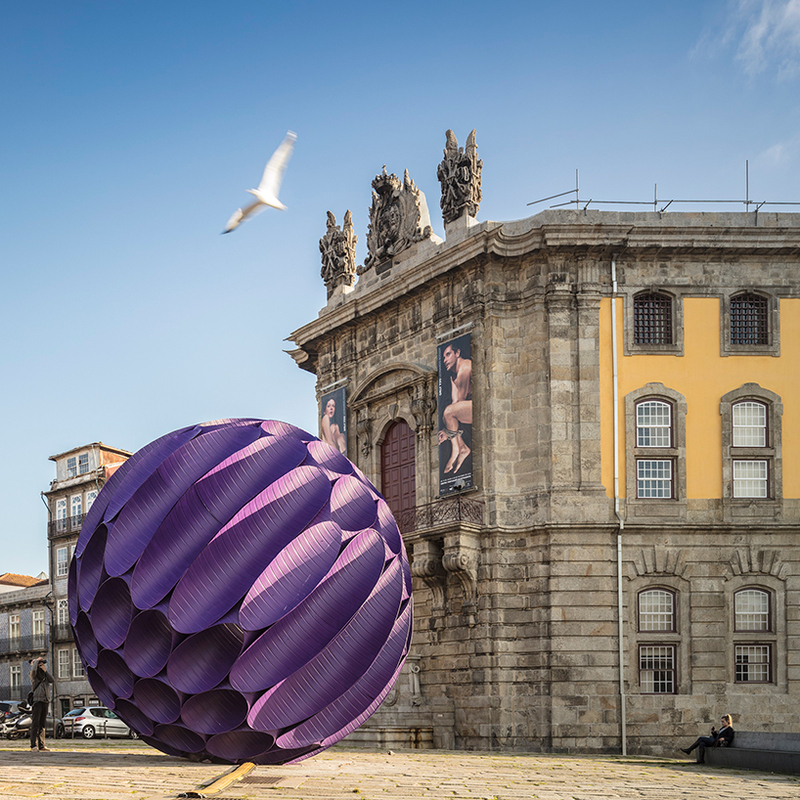 photographed here by fernando guerra, ‘eclipse’ ‘enters the public space with a disruption of scale that entices interaction and fruition,’ filipa frois almeida and hugo reis of FAHR 021.3 describe. 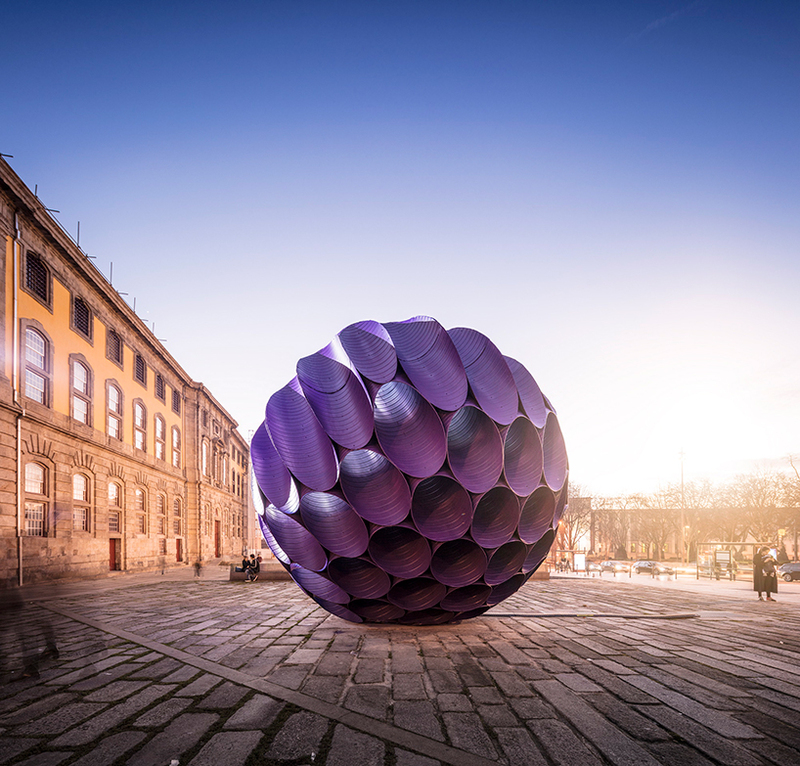 ‘eclipse’ stands in an off-center position within the public square, creating a sharp contrast with the surrounding architecture’s understated and historic elegance. 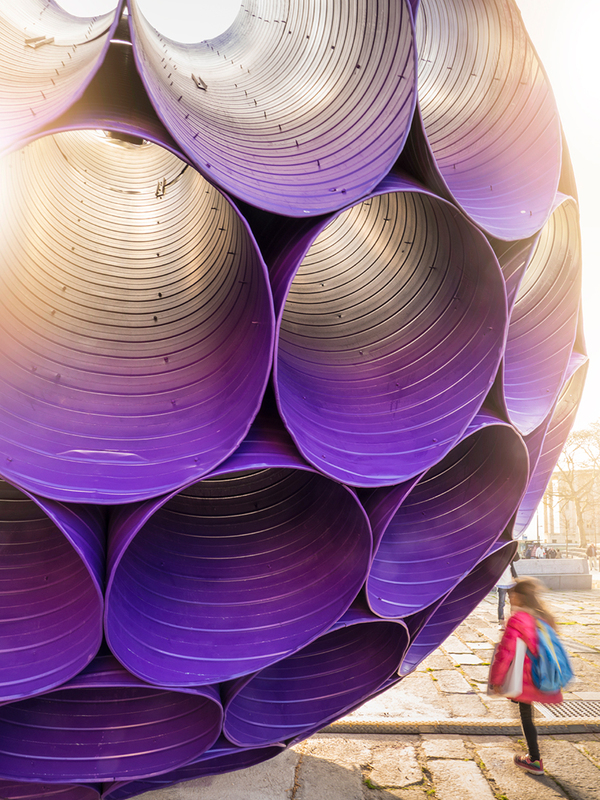 the sheer enormity and color of the installation forms a bold relationship between the installation and its urban context, inviting visitors and locals alike to re-consider the site through a new lens. 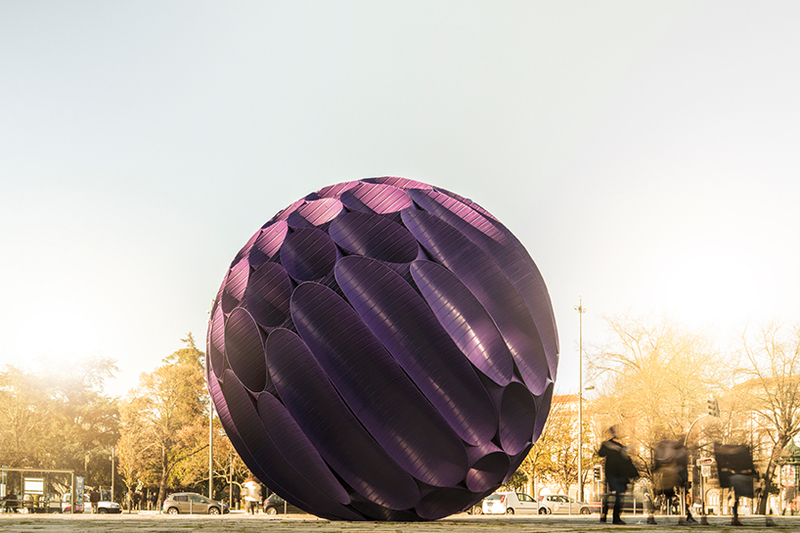 FAHR 021.3 has constructed the six meter diameter sphere using ventilation ducts, whose metallic texture and modular structure are revealed when approaching the piece. 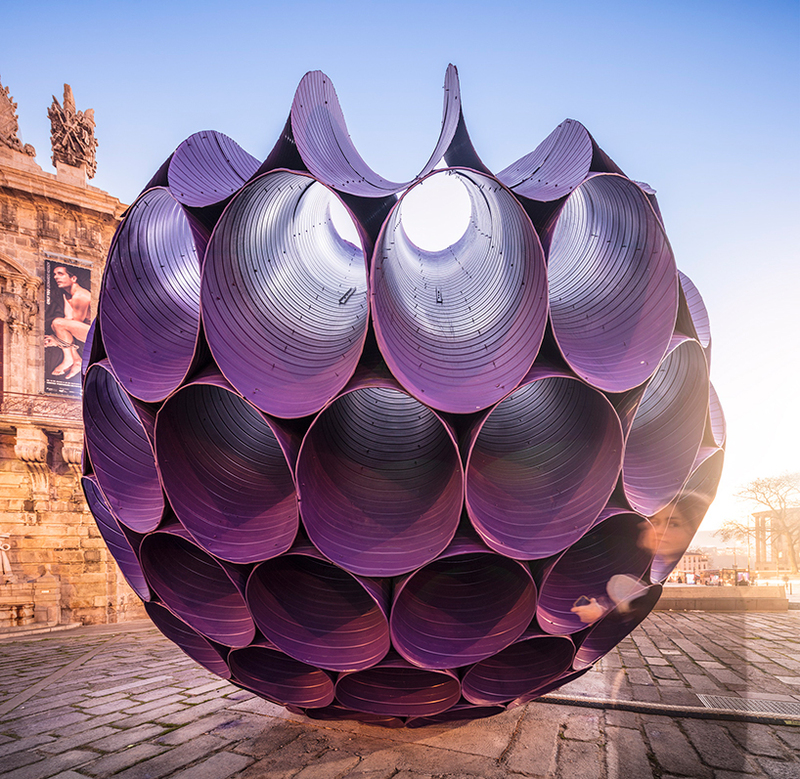 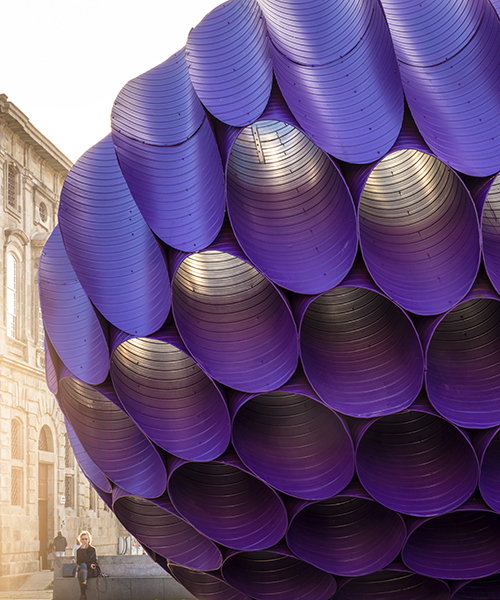 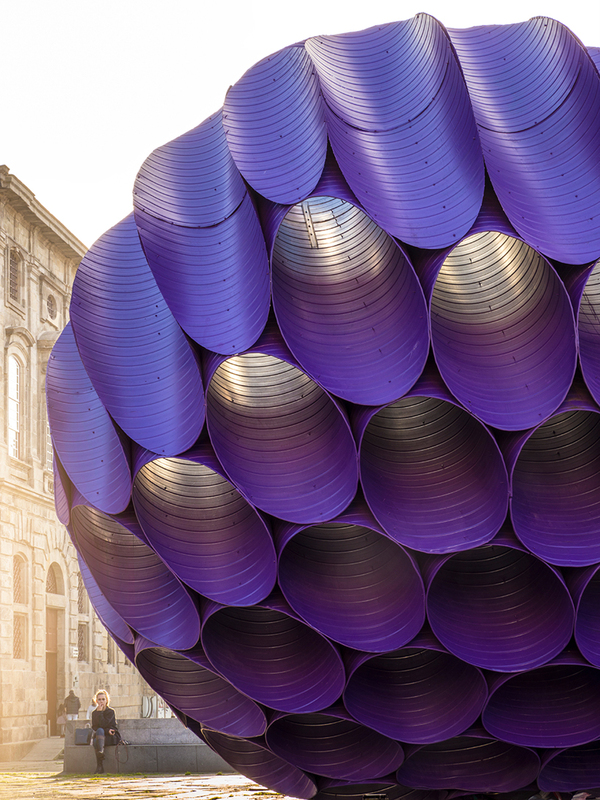 forming a visual dialogue with the city center, the apertures in each tube allow passers-by to peek through and discover different points of view. 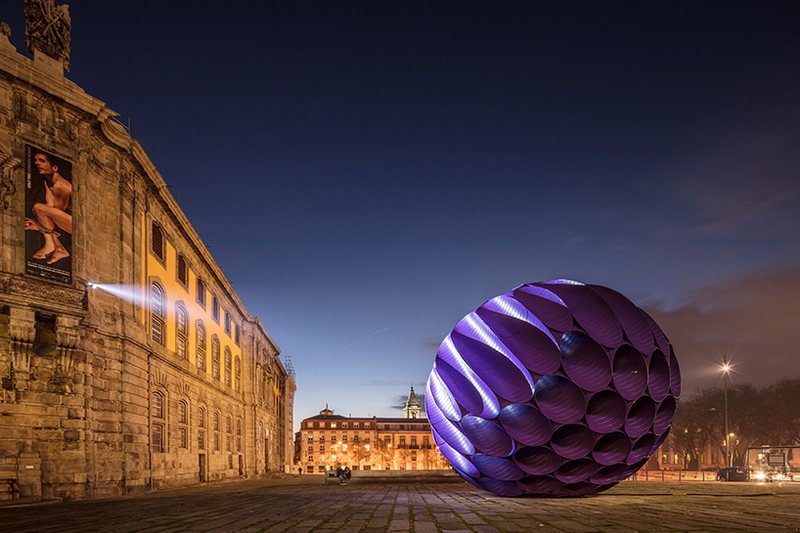 by day, ‘eclipse’ reflects sunlight over the square, while by night, a spotlight strongly illuminates one of its sides and keeps the opposite elevation in darkness — fully living up to its name. 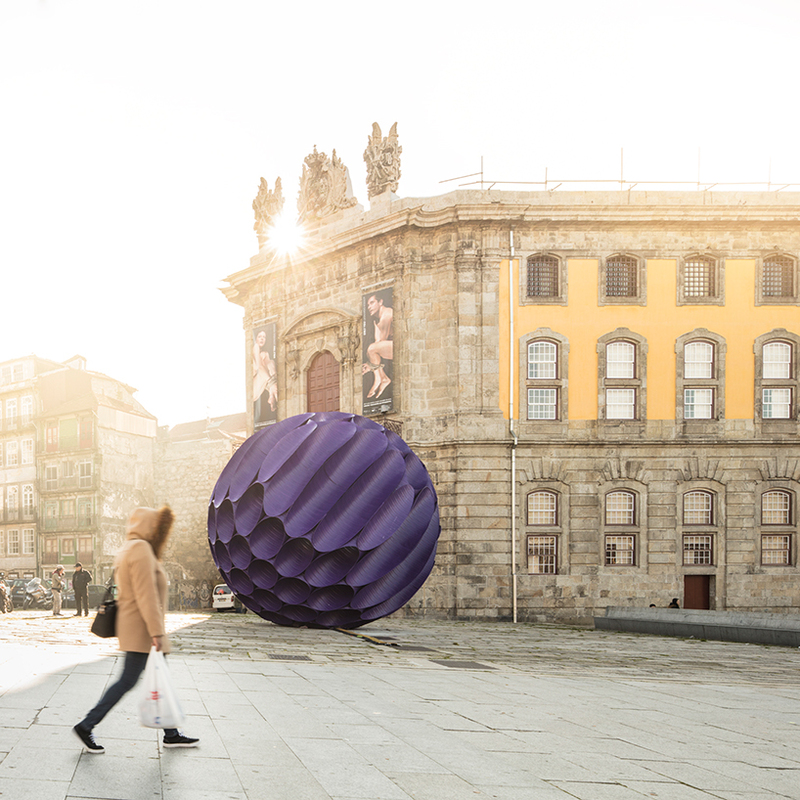 the installation will be showcased at largo amor de perdição until may 2017. 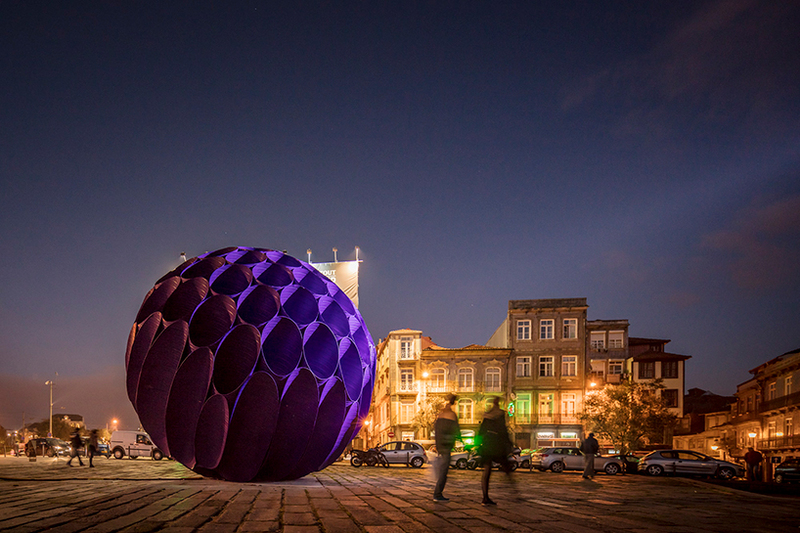 I would like to see this in person, but like the Picasso in Chicago – a third look may be one too many.